This hostel's amazing!! The staff's super friendly, the food's good, view is amazing and the (bath)rooms are clean! They can also help you with booking trekkings and other trips which they did for me as well. I stayed in a girls-dorm which was really nice! I used this hostel as a base camp for the month I was in Nepal. Every time I came back it felt like coming home. the staff really made me feel very welcome! I can't wait to go back!! The sparkling turtle is a really nice hostel. It's located out of Thamel but with a 30 minute walk you will be there. 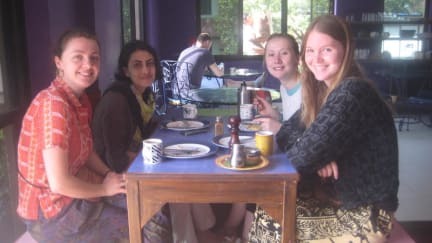 The vibe in the hostel is absolutely amazing and the staff very friendly and helpful, especially Roshan is a great guy. The food in the hostel is good and cheap. I would definitely recommend this hostel. The only i needed was a kitchen where i could make my own food. Everything else was just great. The atmosphere in this hostel is amazing! Normally I'm not into throwing myself into a group, but here all the connections with people just happened. The common room feels like a living room where everyone hangs out. The food is really good, although it takes quite a while before it's ready when you order it. The thing I didn't like is that there are no locks on the doors of the dorms, which made me feel uneasy to leave my camera and laptop in the room, and the lockers were outside of the dorms. Nice and cheap hostel. It's really basic, but the beds are good. In the female room there are only lower beds, so that was perfect! Too bad that there were no lockers or keys to lock the rooms. The rooms aren't soundproof, like I needed earplugs to sleep. The breakfast was perfect, toast w/ eggs or a banana pancake! The staff is really nice and helpfull and the atmosphere in the hostel is great. It's a good place to meet new people! 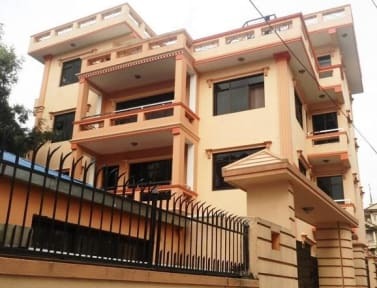 Location is about 50 minutes (walking) from Thamel. Very friendly staff and the rooms were simple but soft beds with warm blankets which made it cosy. A very annoying thing though, the shower/toilets (shower and a toilet in the same room) were always occupied. There are only 3 toilet/bathrooms for a lot of people. Could have just been unlucky though. Also no warm water and bad wifi which is not uncommon in Nepal.